Quite a long title. Could have been a dissertation for a Sociology Masters. But it’s mine now. At this time of year, oh so close to Christmas, it is inevitable that you reminisce about previous Christmasses, the excitement, the things you wanted so bad, the presents you got and the ones you wanted but never did get. Then there were the adverts. I have mentioned Robert Kirkmans ‘The Walking Dead’ (published by Image) a couple of times now. I love it. Set in a future where there has been a Zombie Apocalypse, there are pockets of civilisation left, and the focus of the story is on Policeman Rick Grimes, his family, and the other survivors he meets and forms a community with. They are currently in a prison, holed up and ‘safe’, while the undead roam the perimeter fencing. However, the nearby survivor community at Woodbury (a fortress-like town) has become aware of the prison, and led by ‘The Governer’, a psychopathic villain, they aim to take it by force. This current story arc is subtitled ‘No-one is safe’. It is one of the series strengths that major characters can meet sudden death, reflecting the dangerous, unpredictable environment they are in. This arc also moves the threat away from the undead, and onto the Woodbury survivors. The implication is that we (humans) are our own worst enemy. Robert Kirkman is producing some great writing for this book, and has to be considered as one of the very best writers of the genre (up there with Alan Moore, Stan Lee, Pat Mills, Frank Miller). His work is full of drama and emotion, and knows how to pace a story, even giving the reader superb cliffhangers at the end of each issue. With any comic book, you need the visuals as much as you need the story. It’s an alchemy, and only the best titles and/or best writer &artist teams have it (for the obvious, think of Stan Lee & Jack Kirby on The Fantastic Four, or Stan Lee & Steve Ditko on The Amazing Spiderman). Charlie Adlard, the artist for ‘The Walking Dead’, has a style that suits the gritty, sometimes violent nature of Kirkmans writing. He is a British artist, and started out on 2000ad, working on Judge Dredd. He has been working on ‘The Walking Dead’ since issue 7. He has been doing the covers for each issue since #25. The covers I am showing here are from upcoming issues (#47,48 & 49 – the ‘no-one is safe’ arc finishes at 48). Not only do they give tantalising glimpses (and nothing more) of what will be happening, but they convey so much drama and emotion. I find the ‘mother & baby’ cover (of Rick Grimes’ wife, Lori, holding her infant daughter) particularly moving – the facial expression (anger? fear?) and position of surrender of the Mother, the way she is trying to shield her child, the movement of the baby in her arms, the aggressor standing mainly off panel, shotgun ready. The prison perimeter fence looks devastated, the feeling is one of desolation and finality. Finally, this is the most intriguing cover. 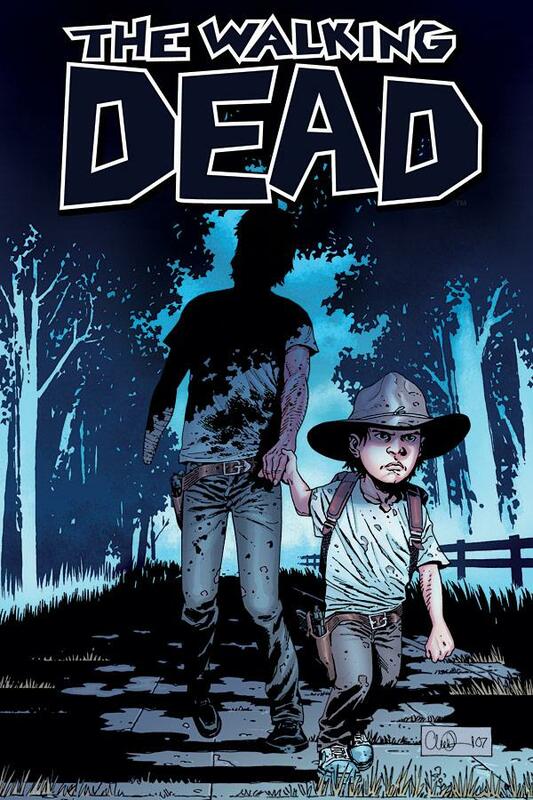 Issue #49, Rick Grimes (part covered by shadow) being led by his young son, Carl. Ricks posture suggests one of 3 things – he has either become undead (as he is drawn in a typical ‘Zombie’ pose – think ‘Flyboy’ in Romeros ‘Dawn Of The Dead’) or is weak with injury, or overcome with grief and is incapable of doing anything – even escaping from danger – without the aid of his son. They certainly are not in the confines of the prison any more – this is open space, bristling with threat. Carl looks determined, intent on leading his Father to safety. The comic book cover is the first impression, and Adlards art for ‘The Walking Dead’ is the perfect selling point for Kirkmans brutal survival tale. It demands your attention. It demands to be read. Can I have all these issues now please??? ‘World War Z’ which acts as an ‘oral history of the Zombie war’ and tells of how humans from all over the world fought back against legions of the undead. 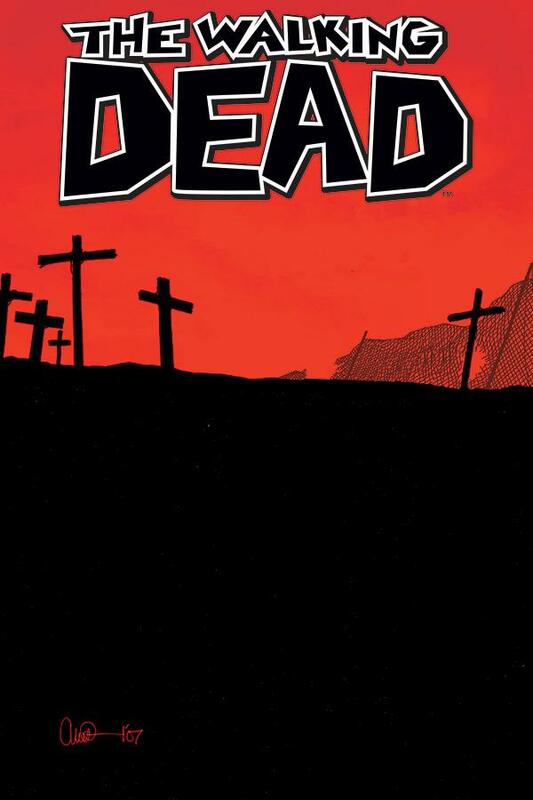 The second reason is Robert Kirkmans’ ‘The Walking Dead’ comic series, published by Image. 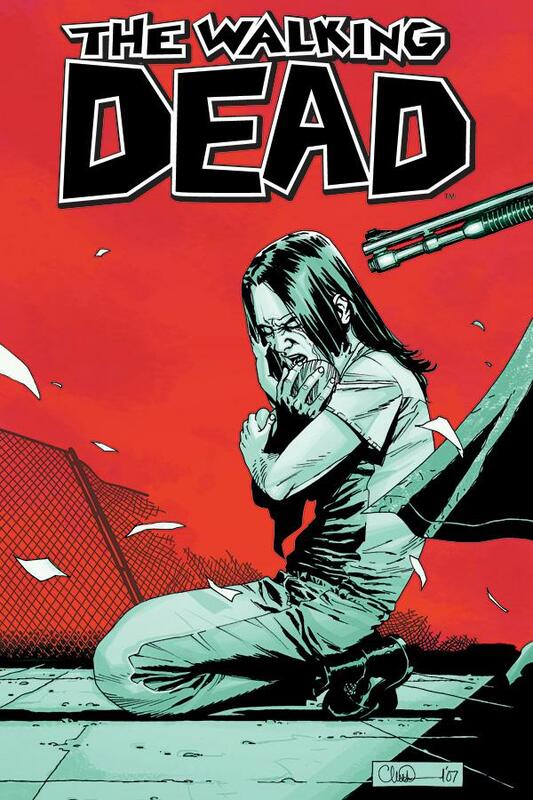 It’s highly addictive, more like a drug, and Kirkman (the writer) really knows how to build up tension and leave each issue on a cliffhanger moment. I want to write more about ‘The Walking Dead’ at a later date, as at the minute there is a major story arc underway, and I want to get through that before I begin to enthuse about its genius. I got back into comic books in a big way a few months back, mainly off the back of the Marvel Comics ‘Civil War’ story, and ‘The Walking Dead’. The thing is, how do you know what (comic book titles) are worth picking up and which are to be avoided when you haven’t really been reading them for several years? Well, you go on forums, you can check out the ‘what other people are buying who bought this’ approach of Amazon or Play, or you can look at previews of titles on Comic Companies websites, like the impressive Image Comics website, where most new titles covers and first five pages are there for you to peruse. The concept is a twist on the traditional Zombie titles, with Vampires protecting Humans from Zombies, so their food supply is not affected. The site reprints all the issues so far (1 -3) and each page is readable online (it is not my preferred method of reading a comic). Each page has underneath it a few lines of comment from the creators, and underneath that some comments from users on the site. 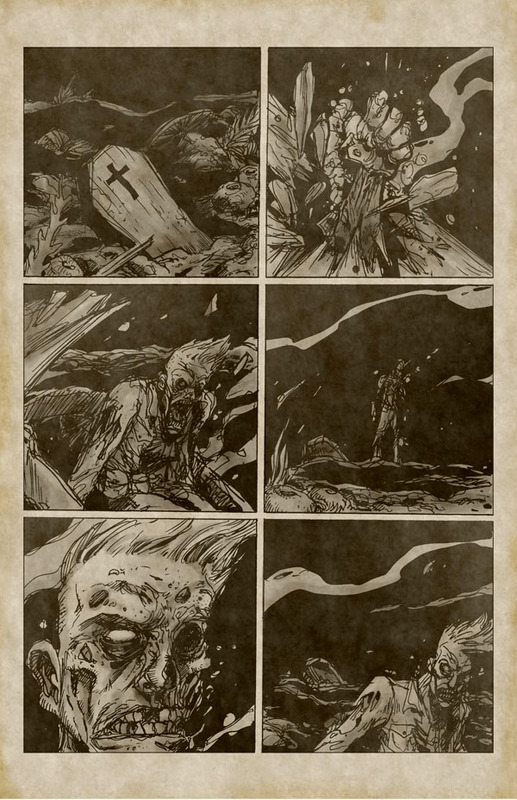 It’s a good package, and worth your time in having a look at it if you are into Zombies in comics. The writing is nicely paced, and although I wasn’t impressed with the first few pages of art, it certainly starts improving and you get used to the style quickly. It’s not great art, but it does its job well enough. Overall, I would give the 12 pages I have read an overall 7 out of 10.